It’s surely only a matter of time before Nessie gets a few lines here. So thought I’d jump the gun…and share an experience of mine that although it is not first hand, it’s pretty damn close! I was having morning tea with a lady named Liz McLeod who had the position of Secretary to the General Manager of a major metropolitan TV Station. If the name McLeod rings a bell, it is because Liz was married to Torquil McLeod who was the Gamekeeper at Loch Ness. She told me that early one morning, Torquil flung open the door to the cottage and came running inside. He was ghostly white and could hardly speak! Liz said: 'Don't tell me you've seen Nessie?" He had!! The rest has been well documented online and elsewhere. He saw the animal with binoculars OUT OF THE WATER on rocks across the loch. I have no doubt what Liz related to me was true as she was a friend and a reputable person holding a highly responsible position. I have been to the UK a few times and always wanted to visit Loch Ness but have not been able to find the time to travel there. The closest I have got was to tour the Lakes District and cruise on Lake Windermere, a large body of water also reputed to be home to an unknown creature. Touring Loch Ness is still on my bucket list of things to do. Interesting blog. Thanks for the link. Torquil’s sighting dates way back to February 28, 1960. That’s a staggering 56 years ago. I don’t think he is still alive. I haven’t seen Liz for a number of years, but I will make some enquiries. She was a lot older than me at the time she related her experience, so I’d reckon she’d be at least in her 80’s now! Time is everyone's enemy, that’s for sure. Just hope I’m around when the truth about Yowies, Bigfoot or UFOs is finally revealed. I won’t hold my breath, though…. The ‘powers that be’ have kept things like Roswell under wraps for almost 70 years. And who knows what Government departments really know about the giant hairy man. Or his little cousins for that matter. This report from today's Daily Mail says a cruise ship captain's sonar captured a large object with a hump lying on the bottom. It was gone when he later scanned the loch bed again. His state of the art sonar equipment also found the loch to be a lot deeper that anyone had measured before. The article also said in December last year, it was revealed that sightings of the Monster are at their highest in more than a decade, with five people claiming to have spotted the creature in the last year. That's good news as it suggests Nessie is still around and providing tantalising glimpses of its existence. Maybe a cousin of Nessie? This amazing footage was recently taken in the Thames river and shows a very large dark object with two humps rise up from the murky waters and then duck down again. If you look closely, there appears to be a neck and head turning before it dives. When the size is compared to cranes and boats on the shore, it certainly looks massive! You should get over to loch ness and have a look for yourself Searcher. I hope u get the chance one day. Read my lochness paperback over and over till it fell apart when i was a kid. Its probably the most ridiculed and bebunked mystery of all. Could be the same dinosaur things that have been reportedly seen in the oceans coming in to breed or rest. You should get over to loch ness and have a look for yourself Searcher. It's on my bucket list, for sure. Have been over there a few times but never made it that far north. Did manage a cruise on Lake Windermere in the Lakes District which is also rumoured to have a resident beastie. Beautiful place! Yes i saw that in your post about windemere and recall reading about some other lakes with reports. Might need a wet suit if u head over. Be freezing in there id imagine. Actually the weather was beautiful for that cruise. It was late Autumn (late August) and I remember sunny skies with light winds and mid 20's temperatures. A highlight was when a RAF Tornado jet flew down the lake very low, virtually over the top of the cruise boat! Was just like being at an Aussie Grand prix watching the jet display. Now wonder any monster there would want to stay near the bottom. Loch Ness Monster found by robot! This one was on the news today, apparently a robot submarine has been scouring the depths in search of Nessie and found what looked like a monstrous shape, but turned out only to be a prop from an old movie! Now, where can I find a copy of "The Secret Life of Sherlock Holmes". Yeah... really was a laugh out loud moment when I read that 'Robot Nessie' story! A new picture of Nessie has emerged! It's certainly a very clear photograph. Read the story here and judge for yourself if it is genuine. Reckon it looks like 3 seals playing around. The head shot sure looks like a seal! The photographer has just fluked an unusual shot where 3 of them line up to look like one a longer object. Searcher wrote: Reckon it looks like 3 seals playing around. The head shot sure looks like a seal! you nailed it!! Great spot searcher!!! A weird cousin of Nessie? Or just a pile of logs set into motion by the swirling currents of the Chena River in Fairbanks, Alasaka... You decide! Check out the video on the Bureau of Land Management - Alaska's facebook page. Still not sure what we're looking at here... Watching at full screen on a 27" iMac, I thought for a fleeting moment I could see a head. Moves like a big fish though. We really have very little idea about what's in the ocean, in my opinion. Be beaut to think it was some kind of sea monster...but when you consider the sound was heard at listening stations 5000 ks apart, it gets a bit unrealistic. However, I absolutely agree there are many large creatures in the world's oceans currently unknown to science. The only Nessie news I've come across recently is an article a couple of weeks ago that said the monster had been spotted for the first time in almost nine months. I've tried to believe the Loch Ness story but alas no - can't see it exisiting these days - or whether it ever did. Funny coming from someone who believes in Yowies, UFO's and spirits. ChrisV wrote: I've tried to believe the Loch Ness story but alas no - can't see it exisiting these days - or whether it ever did. ChrisV... If you can't get a handle on Nessie, have you ever looked at sightings of creatures like 'Champ' and 'Ogo Pogo' in the Great Lakes of North American? Like Nessie, they also go back 100's of years. There has been some seriously impressive eyewitness accounts documented on some National Geographic documentaries. In my view, there have been way too many reports of cold water lake creatures in the northern hemisphere to dismiss them all with the wave of a skeptical hand. There has been a proposal that Nessie could in fact be a giant type of eel that is very old and very long. The contraindication to that would be that I don't know if any type of eel that cruises along with it's head out of the water as is commonly depicted with Nessie. Unfortunately with Nessie you also need to try and discount the fake images, etc. The Champ video certainly has an eel-like quality to it since they are known to swim just under the surface causing those wakes, occasionally breaking the surface minimally so you see a bit of a serpentine body here and there. If that was Champ then my bet would be it is a species of eel, previously unknown and very large. A couple of aussies are making news with a Loch Ness monster sighting only a few weeks ago! They even managed to get some pictures to back up their encounter. One theory I've read is that the Loch Ness creatures are mammalian - the so-called "super otter theory". It was in the old Unexplained magazine back in the 80's. It makes sense to me, but who really knows? It’s fun to get the head spinning as to what on earth ol’ Nessie could possibly be. If only some of the many hundreds of eye witness encounters can be believed, here’s little doubt that something has been swimming in the murky waters of Loch Ness for a very long time. 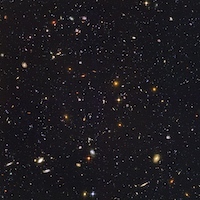 The first recorded sightings go back around 1,400 years to the sixth century. Could it be super otters or giant eels as Simon and Trevor have suggested? Possibly. It is definitely good to have some ideas, rather than just staring at a blank canvas, Given time, perhaps these postulations will be proven one way or another. My theory (not a belief) is for a small population of remnant plesiosaur type animals that come and go from the ocean via subterranean rivers and cave systems. It does fit the sightings criteria of a long neck and a body frequently described as being “like an upturned boat”. Underground rivers are everywhere and like the rivers on the surface, most lead to the sea. Nessie has been seen out of the water so could possibly link up with other rivers though cave systems. They could have adapted to live in both salt and fresh water just like the bull shark does. Could plesiosaurs still exist? Many people firmly believe so, including fishermen who had reported seeing them in the Southern Ocean off the coast of south-west Victoria, near where Simon resides. It would be nice to have the confidence of deep sea fishermen from Warrnambool, Port Fairy and Portland and find out what they really know about what is out there. A 1980’s newspaper report said there have been over 40 sightings in the area over the past few years. That’s quite a lot! It is also claimed there have been over 400 recorded sightings in the waters around Australia. Check the ‘Plesiosaur Sightings’ in the ‘Lake and Sea Creatures’ part of the AYR forum. Of course scientists say plesiosaurs died out 70 million years ago, so all the eyewitness reports must be wrong, no matter how detailed. They conveniently overlook the relatively recent and now famous discovery of the Coelacanth, also supposed to be extinct for 70 million years. As indicated earlier, just exploring the possibilities! That 'Nessie' is a plesiosaur (or several of them) has been my belief also, for a very long time. The sightings of something huge making a land-based foray and crossing a loch access road would lend credence to the giant eel theory, as the standard versions we are used to are well known to move between water masses. 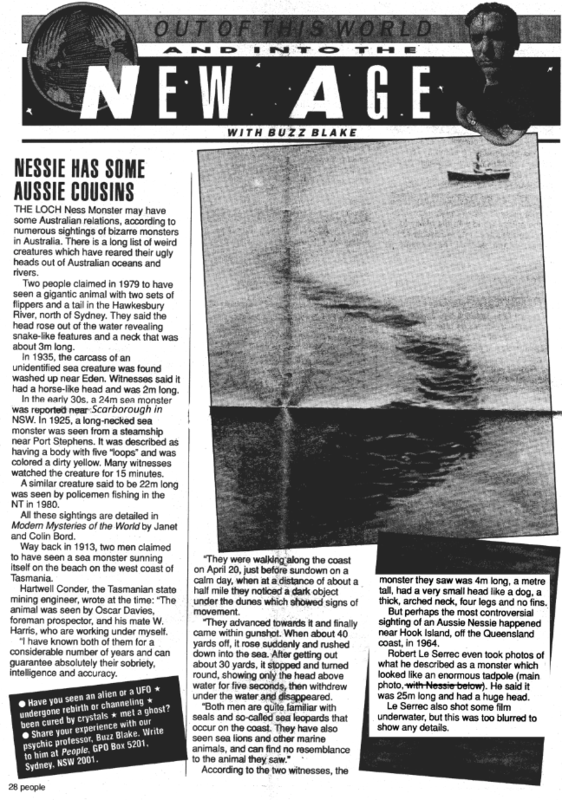 Just as an aside, I started going through some of my crates yesterday and found this old clipping from decades ago, of a sighting of something odd in North Queensland, and something 'like Nessie' in Scarborough, NSW. Unfortunately, when I scanned it, the crease of the page obliterated some of the words and made the 'Nessie' pic too dark to see anything, so the little bit of info on page 2 of the story, I pasted onto page 1 over the indistinguishable image. Searcher, thank you, that article is excellent!